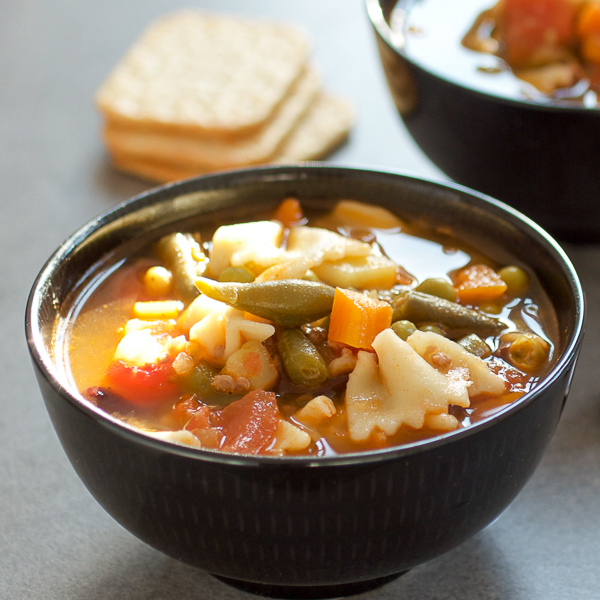 Minestrone soup: thick, warm, comforting and overflowing with vegetables. This Italian classic is a favorite in my family. The recipe is one mom picked up while living in the States. We love it when she makes it, and I’ve put it in my repertoire as well. You know me and soups. If I could marry soup, I would. 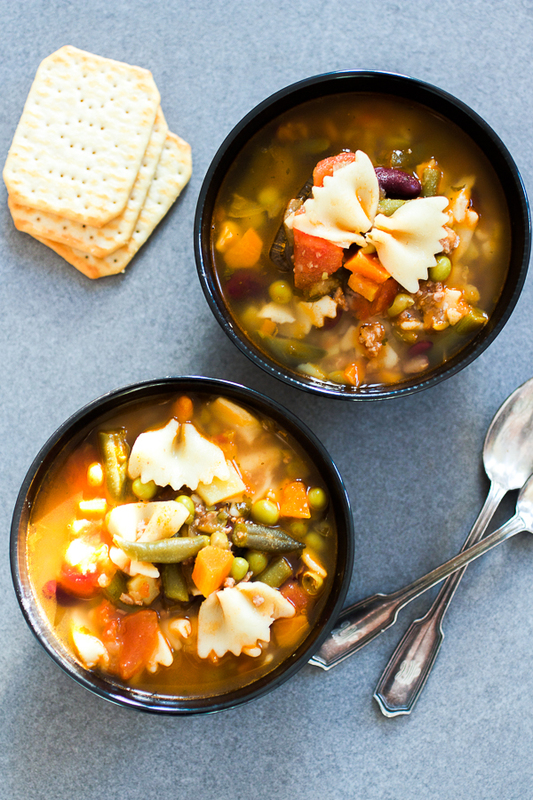 Putting aside the silliness, minestrone is a bittersweet memory for us. When we arrived to the US, it was only the three of us. Mom, dad and I. Sarajevo siege would last a few more months. But we did not know this then. 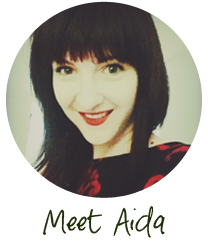 We lived in constant fear, as my sister and brother stayed behind, in Sarajevo. Sister decided to stay for love. Brother couldn’t leave the army. Our beginnings in the US were tough, but I don’t have to tell you this. All beginnings are hard. Change is. This fateful division of our family, one cell divided into a new “two-in-one” family, affected everyone. Especially mom. In the short period of time since we left Sarajevo, she’d already been to the emergency room twice. Doctors couldn’t detect any physical roots to her repeated loss of consciousness. Dad too, was out of his element. He’d decided to return to Sarajevo before airplane wheels touched the ground in the States. This wouldn’t happen for another ten years, but we didn’t know that then either. We were there for the time being. And now mom was in the hospital. He ran from the hospital to home, from home to the hospital. He tried to cook. He tried to clean. He walked for miles in his good European shoes, not at all conducive to American suburban highways. Thrusted into a strange new world, he was like a character out of All Things Fall Apart. Mom was fragile. Pale. Tired. I recently found a photo of her from about that period. For a moment I couldn’t recognize her. She looked close to 70, and she was in her early 40s. Hollow cheeks. Hopeless eyes. A large blazer hung off her the way a coat hangs off a coat hanger. She was released never establishing why she was admitted. They threw around the words like stress. Stress. We laughed. Stress. Stress was modus operandi. The way one lived. What do you mean stress? Show me someone without it. Soon after, she started exhibiting signs of arthritis. Joints on her hand doubled in size, as if they belonged to the hand of a giant. Everything burned her from inside. Sometimes she couldn’t move her arm. Sometimes she couldn’t move either one of her arms. Thunderbolts of pain spread through her body any time it considered a move to be a sudden move. The winter hit hard. The arthritis hit harder. But in those few weeks mom had found a job. It was a great thing for our family. We were establishing routines. We drank our coffee in the morning. Then I’d catch the bus to school. Dad drove mom to work. We were getting somewhere. But long before coffee, she used to wake up and I’d hear weak grunts, her sobs and moans. I’d walk over to their bedroom, and watch quiet tears run down her face. She couldn’t put a shirt on. Where did this malevolent condition come from? Was it genetic? Was it from years of washing clothes by hand in cold rain water because during the siege we had no other? Was it walking up the stairs to the 15th floor and bringing up tens of liters of water each time? Was it the pesky stress they talked about? Sometimes, after I’d help mom dress, she’d ask me to start on dinner after returning from school. She’d give me simple recipes, something even I could do. 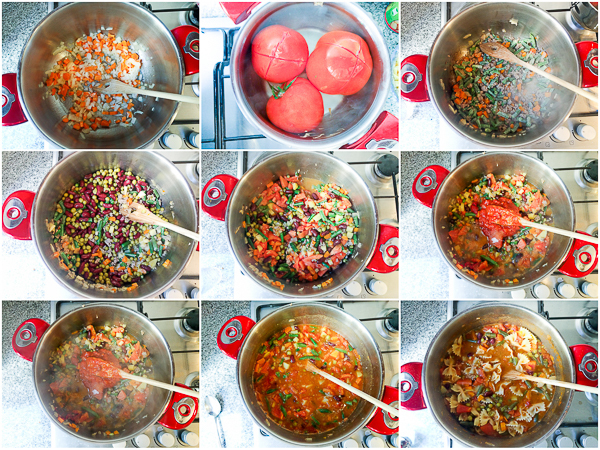 Minestrone for one. This would be my contribution to our family’s new beginnings. 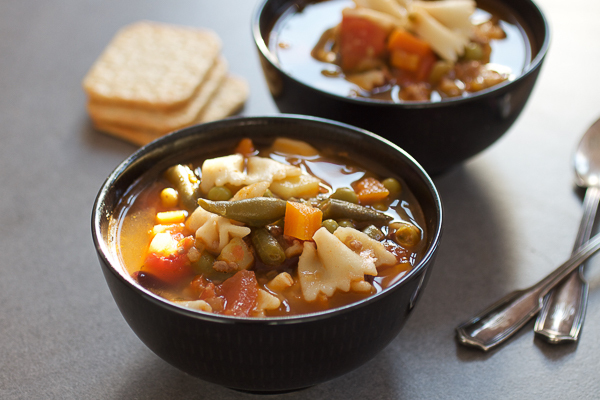 Would you like to see more recipes like minestrone? Check out the recipe index. I recommend Herzegovian mushroom soup (we are talking mushrooms, tomatoes, celery and parsley chunked up and simmered sweetly), or the traditional Bey’s soup (okra like you’ve never seen it before). Peel and dice all vegetables. Cut ends off green beans, and cut each into 2-3 parts. If using canned vegetables, place in coriander and wash thoroughly. Oil a large pot and simmer onion and carrot on medium until onion crystalizes (about 10 minutes). Add beef and continue simmering for 5 minutes. Meanwhile, mark an x on bottom of tomatoes and bring to boil in a separate pot. As soon as their skin starts shriveling, take out, place under cold water, and skin. Dice, and keep juices. Add potatoes and simmer another 5 minutes. Add a little bit of water. Add beans and peas and simmer another 5 minutes. Add a little bit of water. Add tomatoes, tomato sauce and paste. Also add 5 cups of water. Stir vigorously. Add in the seasonings and bring the temperature up to high. Keep on high for 10 minutes. Bring to low and put in elbow pasta. Leave to simmer for another 10-15 minutes. Taste to make sure the seasonings are to your liking. Add more if necessary. Serve hot, with sour cream (optional), and a nice piece of bread. Meat is also optional. Removing it you make this into a great vegetarian soup. 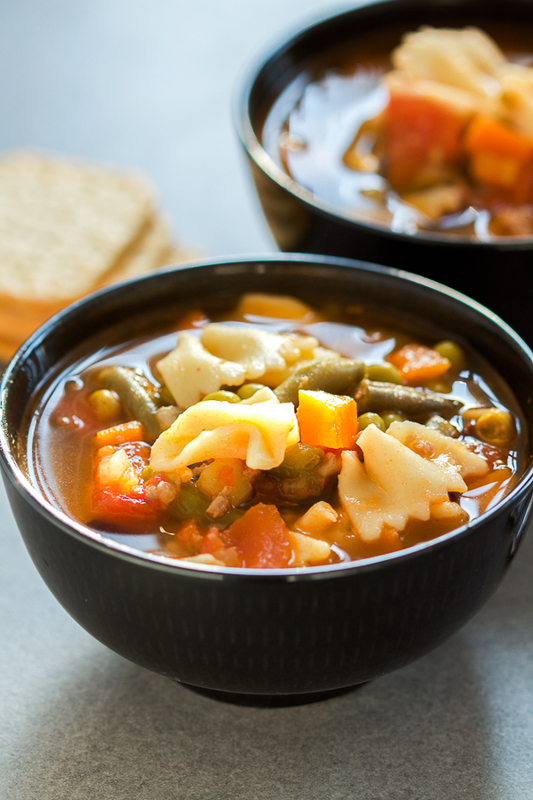 This soup is thick enough to be the main course with a nice chunk of bread. Alternatively, eat it as an appetizer. If you have different vegetables, and are missing a few on the list, that’s fine. This is a very forgiving soup. But keep it to beans, and celery for example. This isn’t exactly a soup for cauliflower or broccoli. It tastes the best the following day. If you opt for this, don’t put pasta in the first day. Instead, when you’re warming up the soup the following day, throw in a few handfuls of pasta and wait for it to soften up. If you prefer using dried beans, make sure to soak them in water for at least a few hours before use. 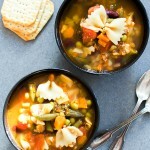 Oooooh minestrone soup, I have been looking for a recipe like this forever!!! I can’t wait to try it. Winter is coming and this is just the thing. Just a question about the red and cannoli beans, do you use canned or dried beans? Hi Marwah! I used canned beans. But I washed them thoroughly. If you use dried beans make sure you soak them in water for at least a few hours before preparing them.